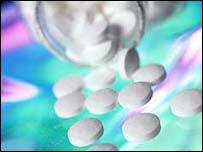 Aspirin and other similar painkillers may halve the risk of developing an enlarged prostate, research suggests. The condition, known as benign prostatic hyperplasia, can make urination difficult or trigger a need to urinate frequently. Minnesota's Mayo Clinic found Non Steroidal Anti-Inflammatory Drugs (NSAIDS) cut men's risk, but did not recommend all men took the medication. The study appeared in the American Journal of Epidemiology. The researchers found that taking NSAIDs was found to prevent or delay enlargement of the prostate. Older men are more prone to developing the condition. It affects almost half of men in their seventies. The Mayo team decided to examine the impact of taking NSAIDS because the drugs had previously been linked to a reduced risk of prostate cancer. NSAIDs are already taken by many middle-aged people to prevent heart disease or reduce arthritis symptoms. However, they are associated with possible side-effects, such as an increased risk of stomach ulcers, disruption of the blood clotting system and asthma attacks in susceptible people. Lead researcher Dr Jenny St Sauver said: "We would not recommend that every man go out and take aspirin, but if they are already taking it regularly for other reasons, our findings suggest another benefit as well." The reason why NSAIDs cut the risk of an enlarged prostate is unclear. Experts believe the drugs may reduce prostate growth directly, or by increasing cell death in the organ. Alternatively, NSAIDs may reduce inflammation in the genitourinary tract in general. The researchers said more work was needed to confirm their findings, and then potentially to examine the optimum dose to cut risk. Dr Chris Hiley, of the Prostate Cancer Charity, said aspirin had been consistently linked to a variety of positive health effects - but stressed the potential side-effects. "We advise men keen to reduce their risk of prostate disease who feel they may benefit from taking regular aspirin, to discuss it with their doctors, and not to dose themselves without medical supervision. "The researchers themselves admit they are not in a position to recommend the lowest dose they know would work so there is still uncertainty on the best course of action."